So, what’s really going on here? I suspect that with the Dow Jones going back over 10,000, Republicans are looking for some other Very Simple Metric that shows Obama Stinks. The dollar looks like it’s going to be declining for a while, so why not that? 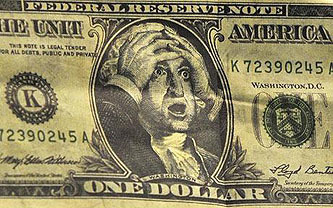 Never mind that the dollar was even weaker during the George W. Bush era — they want people to focus on the here and now. This is helped considerably by the fact that upwards of 98% of the country hasn’t the slightest idea of what a “weak” dollar is aside from the fact that “weak” doesn’t sound very appealing, and upwards of 99% hasn’t the slightest idea of what a reserve currency is or why it matters. This makes it excellent fodder for Trilateral Commission style conspiracy theorizing,1 which in turn makes it excellent fodder for the current intellectual leaders of the conservative movement. This is the kind of stuff that used to be limited to cranks with mimeograph machines but is now beamed into millions of homes via the wonders of cable TV and the internet. That’s progress, my friends. 1Remember back when the Trilateral Commission was running the planet? Good times. How have they managed to fall so low since then?